A survey of over 100 legal professionals, including paralegals and legal assistants, shows how private process servers compare to sheriffs when it comes to service of process. The results are clear: private process servers provide a higher level of service, speed and greater knowledge of the law surrounding service of process. For law firms who utilize the sheriff for service of process, their clients would be better served utilizing a private process server. Service of process is an important part of legal cases and law firms and their clients want it completed as quickly and cost-effectively as possible while adhering to the proper rules and laws. To see the comparison, take a look at the survey results and see how private process servers are able to provide more reliable service of process than sheriffs. For private process servers, service of process is their primary job and their main focus day in and out. Sheriffs are essential to our legal system yet their significant number of high-level responsibilities often means process service is at the bottom of the priority list. Because of this, service through the sheriff can take weeks or months! When sheriffs are able to make attempts, they’re typically between the hours of 9-5 when they’re working. The problem with this is that time is often when the subjects being served are working as well. Private process servers will make attempts outside of normal working hours, such as at 7am or 7pm and will more quickly effectuate service. For example, DGR is able to complete most services with an average three day turn-around. Sheriffs are not part of a business. When you need an update on a service, getting back to you quickly isn’t a requirement for the sheriff. For private process servers who run a professional company and want to keep their customers happy, you can expect a fast response to all your questions including update requests. If you need to postpone a trial or move to extend discovery if service hasn’t been completed, you’ll need a responsive process server. In matrimonial or personal injury matters, where the case is especially personal, clients want to know what’s happening in the case. Having to wait a week to find out where things stand versus being able to provide an immediate response creates two very different experiences for law firm clients. 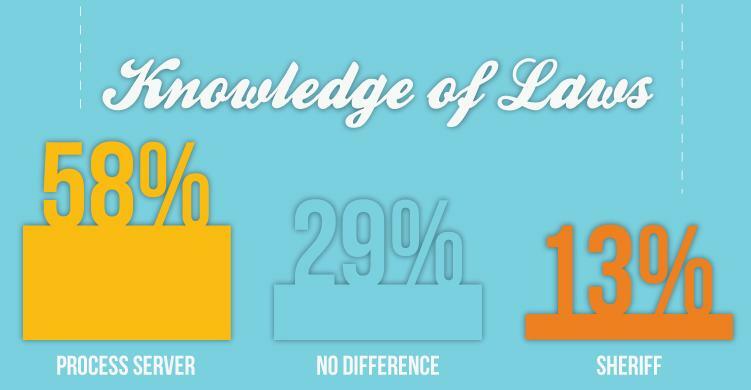 58% of the legal professionals surveyed believed process servers were more knowledgeable than the sheriffs, with just 13% thinking the sheriff knew more. A private process server’s job depends on knowing the law and rules and staying apprised of any changes or updates. For sheriffs, process service is just one of many tasks they are responsible for. Knowing the nuances of each and every type of service and situation can’t be expected of a sheriff who is also taking care of evictions, warrants, prisoner transports and traffic control. When choosing whether to use the sheriff or a private process server, take into consideration the many positives of moving a case along faster including increased client satisfaction and a shortened timeline. Being able to follow the service and be apprised of status updates provides peace of mind, as does relying on a process server who is knowledgeable of all the applicable rules and laws. 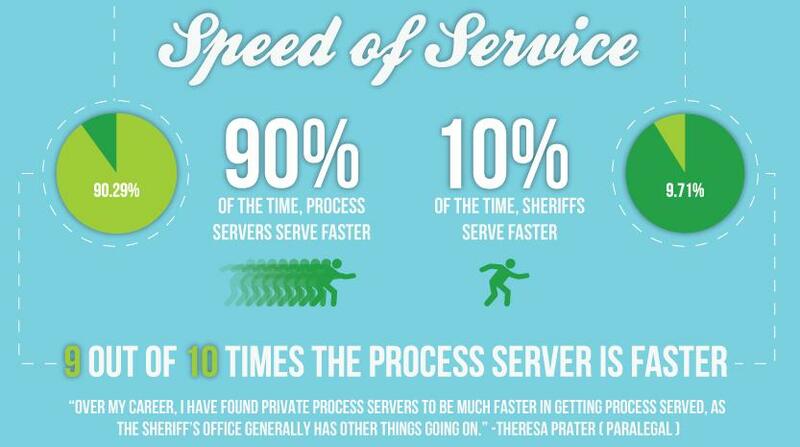 For law firms and legal professionals who want service completed quickly and efficiently, private process servers are the clear choice.